When you meet on a film set, you feel that the chaos behind-the-scenes will never bloom into a love story. Little did Adrika and Parthiva know that this meeting in Mumbai would end up in this lovely wedding that we captured in Mysore! Mangalorean by birth, Adrika has been an air – force kid so she has travelled and has been schooled across the nation. On the other hand, Parthiva is a maharashtrian-Konkani lad who has been born and brought up in Mumbai. Planned and executed completely by the couple and their families, they wanted to keep the vibe of the wedding intimate and personal as possible. From the stay details (destination wedding!) to the wedding favors, everything had a personalised touch to them. 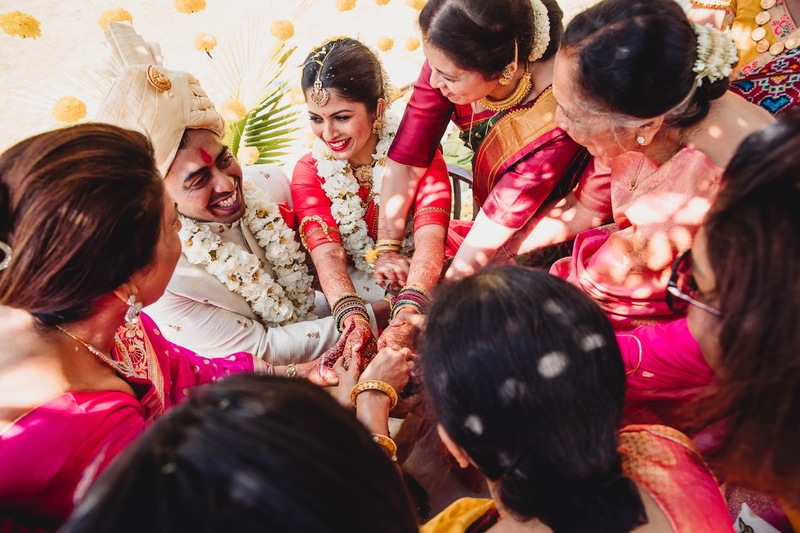 Adrika and Parthiva wanted to ensure that it dint seem like an event company was doing their wedding and entertaining their guests but instead they wanted their guests to feel welcome and comfortable. They picked out Mysore for its tranquillity and warmth. They wanted a place where the guests would not be stuck in traffic to arrive at their wedding and would spend maximum time with them. They selected the Windflower Resort and Spa which was simply splendid. Along with that the bride wanted to ensure that good food was top on the priority list when it came to planning her wedding. One bride who has her priorities straight!